Symptoms of kneecap bursitis include pain and swelling in front of the knee. You may also experience tenderness, warmth and redness on the front of the knee. 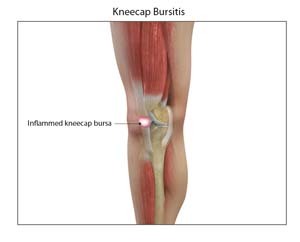 Kneecap bursitis can be effectively treated with conservative therapy where your doctor advises sufficient rest, use of ice packs and elevation of the affected leg to reduce inflammation. Anti-inflammatory drugs may also be prescribed to alleviate pain and swelling, and antibiotics for infections. Sometimes the bursa may be aspirated with a thin needle to remove fluid and reduce swelling or corticosteroids may be injected at the region of the inflamed bursa to relieve pain. Surgery is performed only when conservative treatment is ineffective and involves surgical removal of the bursa.